After ordering the removal of the #Free Balochistan Campaign’s banners from London cabs and buses, giving in to pressure from Pakistan’s authorities, Transport for London (TfL) has issued a letter of apology to the High Commissioner for Pakistan, Syed Ibne Abbas (click to access the letter: page 1 and page 2). In the document, TfL apologises for the company’s “oversight” and stresses that it stands by Pakistan’s demand for the shutdown of the campaign – a serious offence to freedom of expression. The #FreeBalochistan campaign approaches the dire human rights situation of the Baloch people, focusing on attracting public attention to the cause in London by displaying slogans such as “Save The Baloch” and “Stop Enforced Disappearances” on banners and billboards on London’s cabs, buses, underway passages and roadsides. The letter proves that the Pakistan High Commission sent letters to TfL on the first day of the campaign, November 2nd, and on November 7th, when the third phase of the #FreeBalochistan campaign kicked-off, with banners on London’s red buses. The High Commission has allegedly pointed to breaches of the Advertising Standards Agency (ASA), apart from TfL’s own policies, and has threatened the company with a legal action. Nevertheless, as previously pointed out by the World Baloch Organisation (WBO), the campaign is in full accordance with both TfL’s clause (h) promoting life liberty, security, and ASA’s norms. TfL has also affirmed that cabs which have not complied with the order of removal have been notified with an unfit notice. According to a source in TfL, one of the drivers, who refused to remove #FreeBalochistan’s banners, has had his license removed. TfL has threatened to do the same to all drivers who, standing with the right to freedom of expression, display the #FreeBalochistan banners or similar adverts. 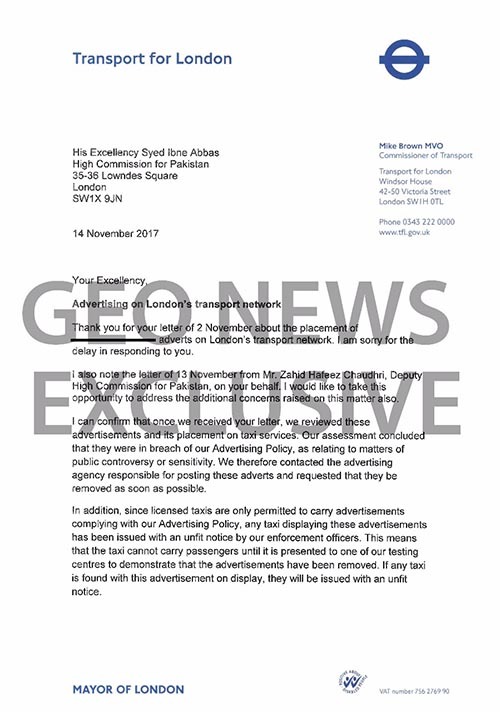 The TfL spokesman added that an amended advert was recieved but has been rejected and all advertisers have been told not to display the amended adverts, which the WBO feels is unjust, discriminatory and seems like an attempt to appease Pakistan by giving into their illegitimate demands of banning our campaign regardless of of the content.. 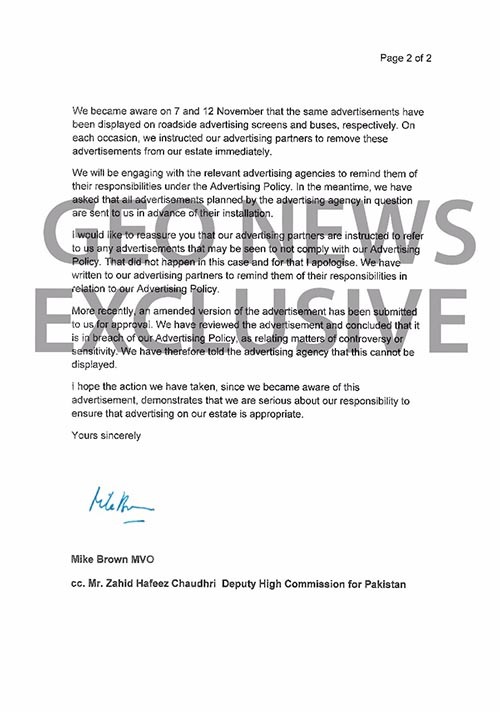 Furthermore, TfL’s Commissioner Mike Brown assured Pakistan’s High Commissioner that any adverts planned by the advertising agency hired by WBO should be sent to TfL before being installed, an unusual procedure. WBO reaffirms the peaceful, legal and respectful character of #FreeBalochistan, Stop Enforced Disappearances, Save the Baloch People and urges TfL to stand by “Life, Liberty and security” as its guidelines state and reconsider its ban on promoting human rights.